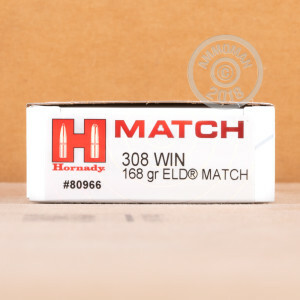 Hornady doesn’t call this 308 Win cartridge a Match just because of how meticulously they’ve poured over its components before carefully assembling them, piece by piece. It’s worthy of its title because of its technologically advanced 168 grain ELD Match projectile, which features the patented Heat Shield tip that won’t let its meplat become warped in response to heating caused by air friction. This bullet’s accuracy is heightened as the result of several other features as well: Its AMP jacket is intensely concentric and its lead core is swaged to guarantee unerring rotational stability; Its secant ogive profile is exceedingly aerodynamic so that it can create only very little drag; And its boat tail design amplifies its ballistic coefficient to ensure a flat trajectory and superior retained velocity downrange. 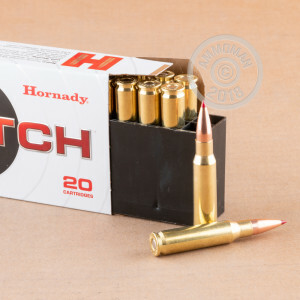 This round’s select brass casing, propellant charge that has been matched perfectly to its caliber, and highly sensitive primer all perfectly complement so accurate a bullet’s performance. The round thus wholly encapsulates J.W. 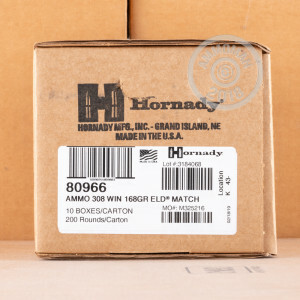 Hornady’s goal when he founded his company: “Ten bullets through one hole."